A show full of music, dance, murder, fame, a touch of politics, and all that jazz. I too was disappointed with this production. The music was great but the acting felt forced and the comedy was overdone. I felt that the dancing needed to be updated. 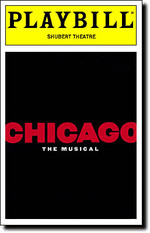 Chicago the Broadway musical is very similar to the movie. The songs and story were all the same. The show had very simple sets and costumes, but the music and dancing were great. The live band was placed on a platform on the stage and played a role in the show - interacting with the characters several times. The casting was in some ways even better than the movie. Tom Riis Farrell played an excellent Amos and got a big "Aw" from the audience during his scene. John O'Hurley as the lawyer was very funny. The one down side to the show was the main actress. Either she had lost her voice during our show or she just can't sing. If she was sick, they should have replaced her for the show, it was almost painful listening to her try to sing. Blah. Long in the tooth. Now starring Ashley Simpson...huh? I was actually a bit disappointed with this production. The set and costumes weren't very impressive, and the singing and acting were just OK. The story was still enjoyable, but I felt it could have been much better. Great play but I have seen other plays with costume changes that were more exciting.